Gabrielle Muccino’s 2003 release is a sophisticated film that examines complex personal and professional interests among a seemingly stable, middle class Roman family. It’s a movie about life: passions, dreams, responsibilities and grievances. 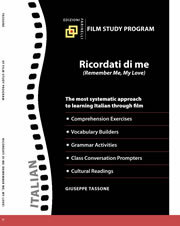 This advanced-level film study text covers six, 15 to 25-minute sequences of the film with exercises for comprehension, vocabulary, grammar as well as speaking and writing. “Spunti culturali” are included for each sequence to enrich cultural knowledge of Italy as relates to the film. Class discussion topics are included with each sequence. Students are also challenged to “predict” sequence to sequence what’s coming next.